For the students of the Master of Digital Media program the first weekend of September is an intense experience. They are asked to create a digital prototype in 48 hours with a group of fellow students they have just met and they know little about. This year we asked them to create museum exhibits to teach elementary age students about space. Darren Decoursey, a recent grad and exhibit designer himself, chronicles the weekend’s experience below. During a sunny weekend in September, I watched a fresh cohort of bright and eager Masters students from the Centre for Digital Media take part in a design jam. 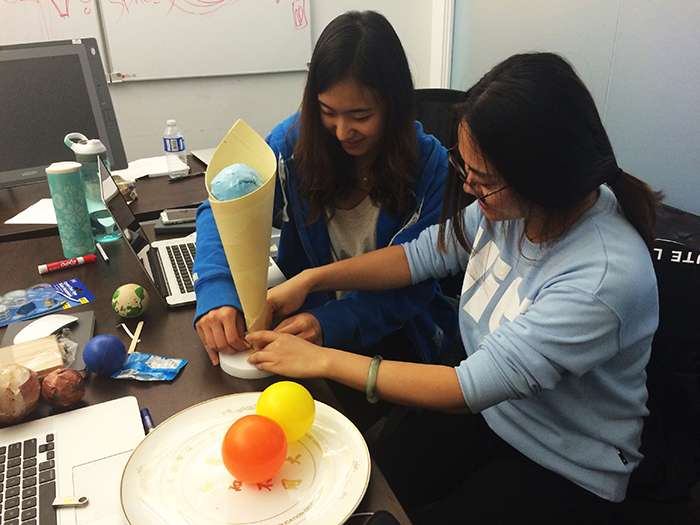 The purpose: to prototype an exhibit for a fictional children’s museum in forty-eight hours. What was the inspiration for this museum focus? It originated as part of a 2-day workshop facilitated at the CDM this past summer in partnership with the B.C. Museums Association. Towards the end of the workshop, professor Larry Bafia offered to pilot this museum jam as part of the Projects 1 course he teaches in the Master of Digital Media program in the first semester. It was an opportunity from him to see how the school's creative problem-solving methods could be applicable in a museum contect. To start, Larry and fellow faculty member Patrick Pennefather split the new cohort into eight groups of six in order to design and fabricate an installation that has some connection to our solar system. By the end, the cohort would display their fully realized prototypes in a large space known as the hanger for visitors to come and see. Firstly, each exhibit needed to teach complex subjects in a simple yet engaging fashion. Kids frequently have short attention spans, so communicating facts and information in a punchy visual manner with sound effects may help keep their interest. Humour and amusing metaphors have a way of connecting the exhibit with things familiar to the target audience, and several groups used this effectively to stand out (e.g. 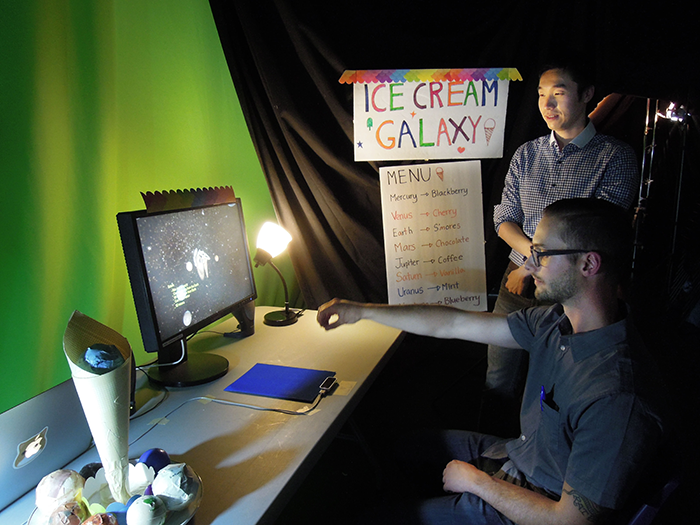 one of them associated the planets with ice cream flavours in an exhibit titled “Ice Cream Galaxy”). Secondly, exhibits often include physical props and touchable components; these must be designed both for sturdiness and safety. Even in a design jam, components may break unexpectedly. Knowing this ahead of time and testing carefully helped the team's strip out things that were unnecessary or potentially dangerous. Lastly, the onboarding process would need to be quick and sparse, otherwise kids might miss the objectives for each installation. Participants may get up and leave halfway through an experience, or mess with the interface by pressing several buttons simultaneously. As a consequence, students had to plan for many different scenarios and situations. As a graduate from the Masters program, I have been involved in designing several installations, so I wanted to see how well the current batch of students applied their skills and creativity to this task. And what I witnessed was amazing. After writing their topics down on the board, each team proceeded to their project rooms and started brainstorming. I could see by the end of the first day how they had determined their roles and responsibilities. It was clear who the project managers were, as well as the designers, artists and developers. Students sketched out their ideas on a whiteboard, and began to research the science behind their selected topics. By the second day, the teams were hard at work, sketching out artwork and building grey-boxed versions of their exhibits in the Unity game engine. I was pleased how quickly each team determined which features might be cool to design, but not realistic to build in the time allotted. Scoping down is one of the hardest things to do in a design jam, but having a fixed deadline can keep a lot of wild ideas in check! In addition, the students understood they could not rely solely on technology in order to complete their exhibits; that’s where good old-fashioned paper prototyping and cheap dollar store supplies came in handy. By the third day, I noticed several groups had split up their work based on digital and physical tasks. Half of the teams focused on building paper-maché, cardboard or styrofoam objects in the hangar, while the other half raced to finish development work and Photoshop designs before the deadline. I noticed three teams had smartly collaborated by sharing a space under a makeshift tent of black curtains, near the side of the hangar. On Sunday at 3pm, the whole exhibit was ready, and the faculty and guests finally arrived. Early on in the design jam, on person from each team had been selected to come to the hangar and collaborate on the overall layout. This layout helped contribute a sense of narrative and consistency on the final day, as visitors were guided through different parts of our solar system in a curated experience. The variety and imagination that was on display was truly exciting. 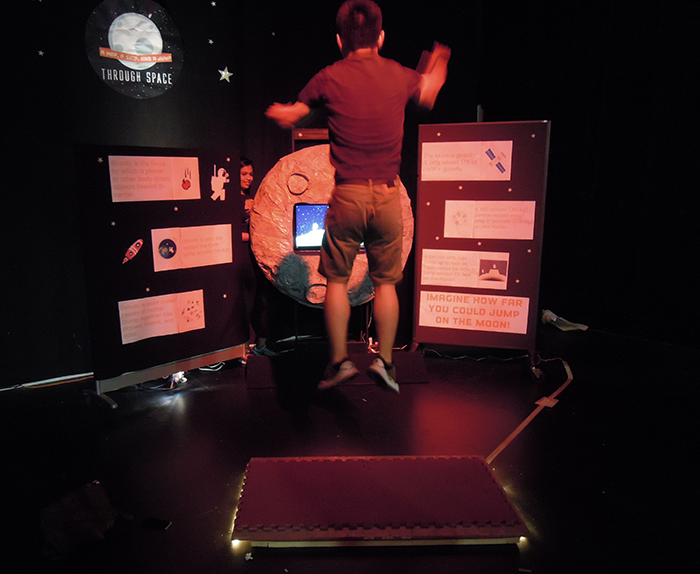 One group used a special sensor to track visitors’ hand movements, while another made a gravity-based interaction where users had to physically “jump” while their virtual avatar avoided deadly craters on the moon. Still, another group lead a tour around a mysterious black hole, and nearby a “soundscope” presented the recorded sounds of each planet in the solar system. Altogether, I felt each exhibit presented a fascinating glimpse into our solar system, and if refined further, would be a great addition to any science centre across the country. With the first iterations of their first MDM digital media project completed, the students went on to refine and improve their products. The exercise showed them what they could do and how to be creative with time and material constraints. It introduced them to their classmates and immersed them in a creative production. Who knows maybe these great ideas will be in a Science Museum in the near future.